Hi there! I am popping in to share a card that I made for Iron Craft Challenge. 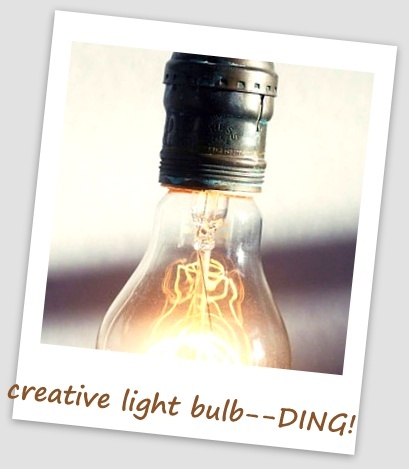 Chaitali is the hostess of this creative and inspiring fun blog called " Cuts, Crops and Creativity"! 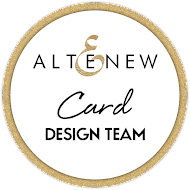 She is into her 2nd season as she started out with 5 video interviews with some of my favorite and talented card-maker/ bloggers! With each of the guests, Chaitali picked out 5 themes for the challenge. I plan to tackle all of them. Here is No. 1. The inspiration came from Julie Ebersole's interview. 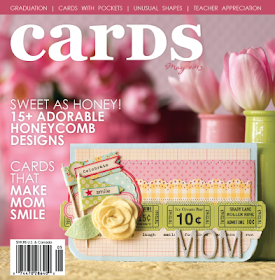 It's all about latest TRENDS- watercolors, stencils and dies are the top 3. ~let's not forget the Washi tape and sequins! I am hoping to do all 5 challenges from Chaitali's inspiration. Let's see if I make it before the deadline! Let the fun begin! Hello! 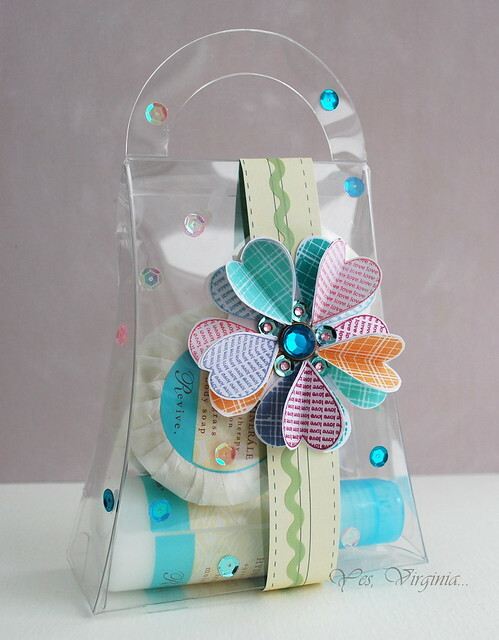 Time for me to share my projects with you over CAS-ual Fridays Stamps Blog! 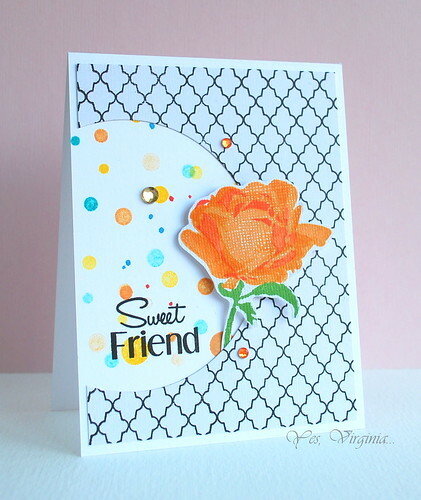 Lately we have so many new Fri-Dies and stamps that I have been having so much fun creating! Here are the proof! My next card is a fun one! For more details and information about these two projects, please stop by here to check them out. The comment feature in this blog post has been turned off. 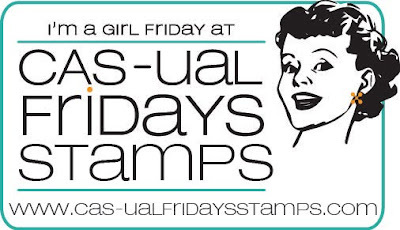 I would love your feedback and comments over CAS-ual Fridays Stamps. SRM Prize Pack Giveaway Alert! Over Virginia's View Challenge, there is a SRM prize pack giveaway! Details are here. Here is a project that I share over Virginia's View Challenge. 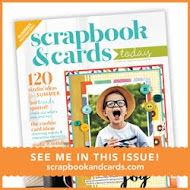 If you like what you see, go here, link up and enter to win! Hello! Today's card was from all the discarded parts. In my attempt, I put them together and re-created a decent one, I think. It's hard to tell that all these elements were unwanted parts at one point. So when you see your discarded elements sitting on your craft desk, just try and make something out of nothing....you will be surprised what you can do. Use it as an exercise! Why not!? I think this card had a re-birth and is now good to go! On a side note, over last week while visiting my in-laws in Ottawa, I received this huge packed box of Stampin' Up goodies! I am so blessed to have a sister-in-law who totally gets my stamping addiction. Florence got this box for me from a charity auction!!! She bid it just for me! 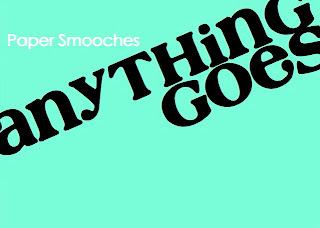 You've got to love a sister who does great deeds (wink), right?! Hello! 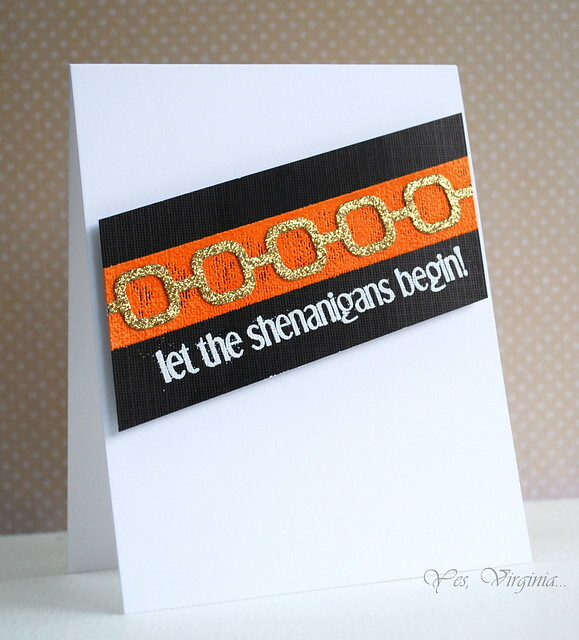 I am sharing a card that I created...just for the fun of it. I had these stamps sitting in my pile, so I decided to be a match maker and see how that works! I kind of like it when I just play...for no reason. Guest Design at Time Out Challenge! Hello! I am absolutely honored to be the guest designer over Time Out Challenge! 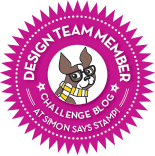 This is a fairly new challenge blog and the DT behind this team are talented and sweet! I was asked to create a card as an inspiration. So here it goes! I love this collection of Basic Grey (Fresh Cut) and had used it a few times already. So this time I stamped on the pattern paper and used only one stamp for this card. The sentiment is from CAS-ual Fridays (CAS-ual Elegance). What do you think? 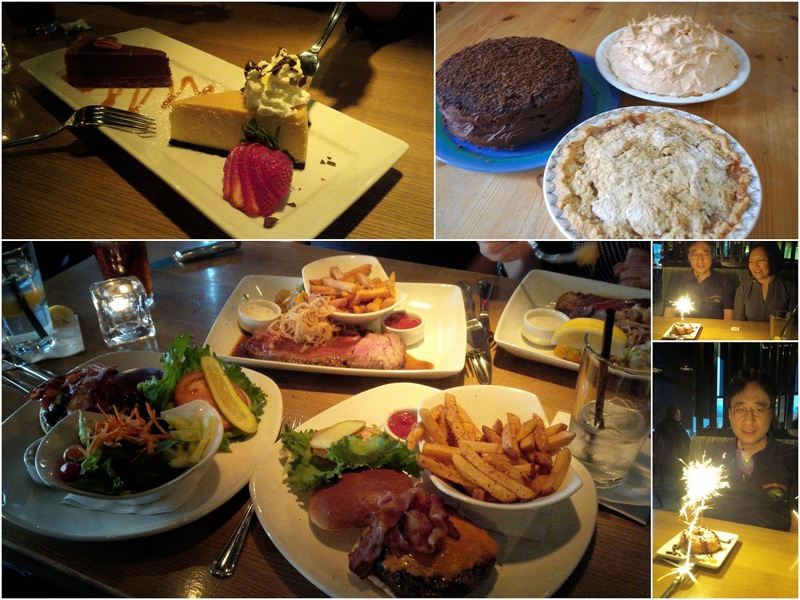 I hope that this inspired you and that you will join the Time Out Challenge! The challenge is to CAS my card with YOUR own twist!! I will love it if you can stop by and check out the challenge! Big thanks to Sandie and Nonnie for the invite! I can't wait to see what you create from the inspiration with this card! In case you think my love for water-coloring in on the wane.... well, not so fast. 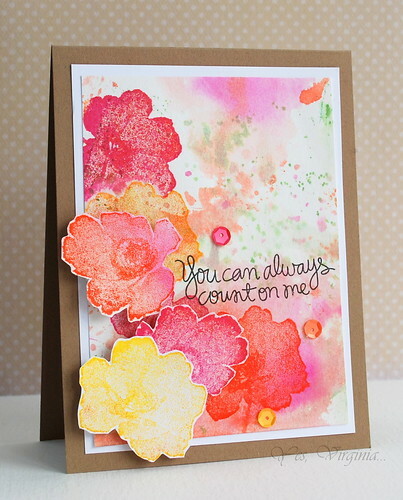 I am sharing another card with watercolors today! I started out with stamping and masking some flowers, then I added a watercolor background. (details here). The challenge is to complete a card within 90 minutes (including taking photo and uploading a card). The theme is paper-piecing! I chose a stamp set (So Kind) that was easy to cut and assemble. I love pattern paper and could never use enough of them, so I jumped at the chance to play with Basic Grey's RSVP collection. My idea of making it into a quilt-like design came quickly, so I had plenty of time to do hand-stitching. See the white threads? They are hand-stitched! I find it hard to use RSVP pattern paper, but this challenge gave me a push and I actually love what I made! Also, there is a new wrap-up post over Virginia's View about the stencil challenge. You can check it out here. Hello! 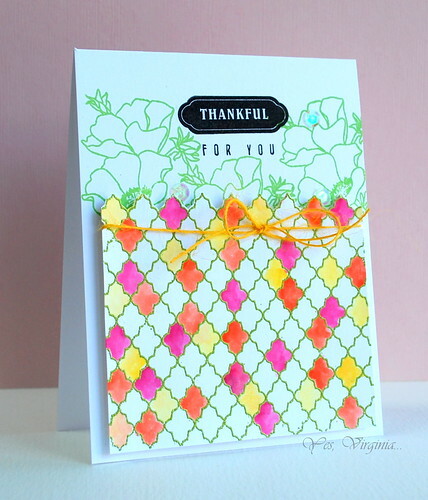 Have you ever been inspired by patterned paper? Well, I have! 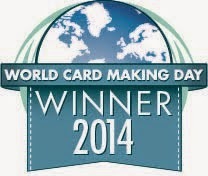 Today's card is the proof! I was inspired by the rich and gorgeous Fresh Cut (from Basic Grey) and decided that I will make a card with it! I gold-embossed Linked (from CAS-ual Fridays' Fri-Die) and Remember (Hero Arts). The gold- embossed flower was colored in copics. What do you think? Easy, right? 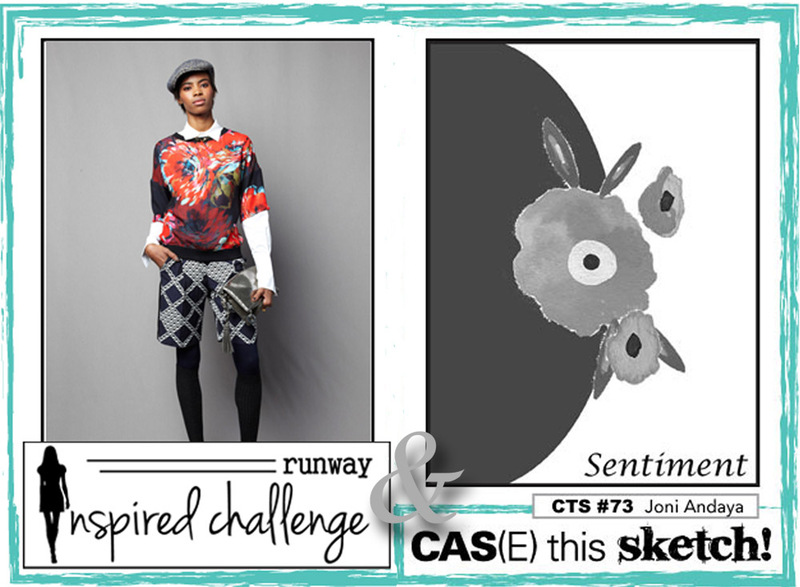 We are having a special challenge this time as we are combining the runway photo with CAS(E) the Sketch Challenge! Fun, huh? 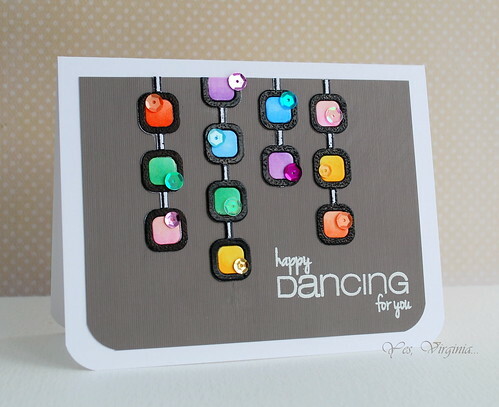 In this card, I used the stamps that Runway Inspired DT Tasnim ( now co-founder/owner of the new Altenew) designed. 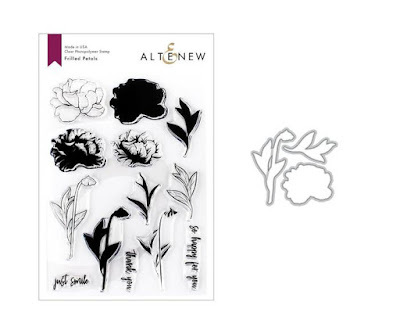 Have you heard of this new stamp company Altenew run by Tasnim and Jennifer? The stamp designs are top-notch as you can see how amazing this rose stamp is. I know all of their stamps are so popular that some of them were sold out on the first day of release! It is also a bittersweet moment for me to say good-bye to the Runway Inspired Challenge DT. I am stepping down after this challenge. It's been a very fun and creative ride being on this amazing team. I want to thank Jennifer (founder of RIC) for offering me the chance to be on this awesome DT. I hope that you will continue to follow and be inspired by Runway Inspired Challenge! The new DT members will be announced at a later date! Happy Birthday, Stephanie and Dr. John! Today is my daughter Stephanie's birthday....and tomorrow is Dr. John's birthday!! 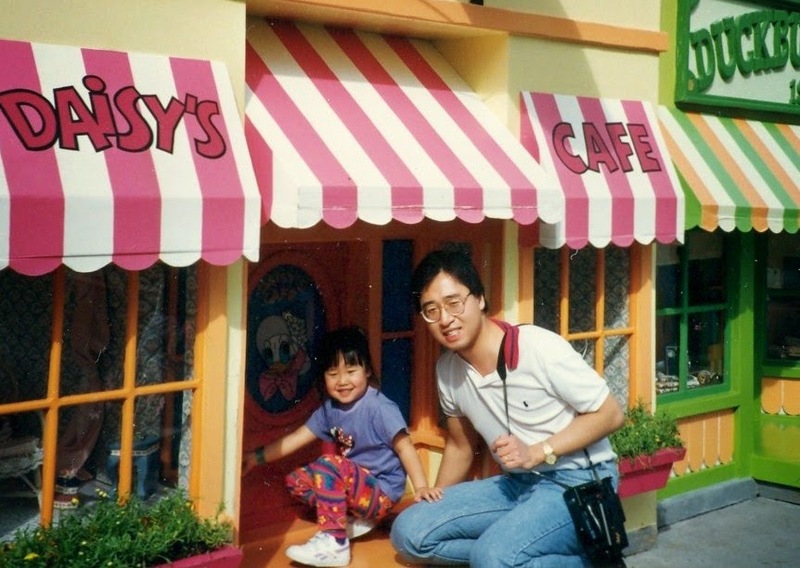 The father and daughter are practically birthday twins!! Yup, there are significant birthdays going on in the Lu household. We are celebrating this special milestone by going out to a nice dinner and hosting a dessert party on Friday.... My card is perfect for this very special occasion. The following photo was taken while we were on Panama Cruise this past January. All 4 of us won a bottle of champagne by playing the trivia game! It would be oh.so. lovely if you stop by to say happy birthday to Stephanie and Dr. John. I know your comments will make them smile! 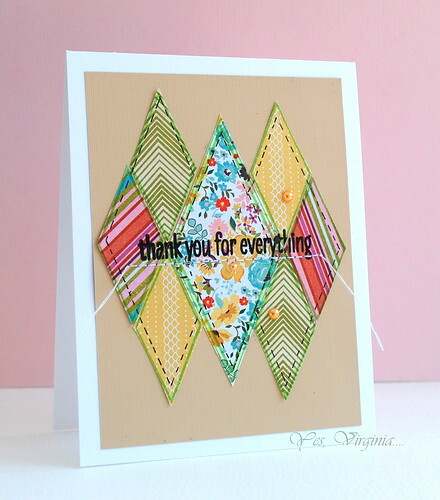 Today is my turn over CAS-ual Fridays Stamp Blog! I have two cards to share with you. This funky card was made possible because of the Fri-dies ( Linked) ! The 2nd card is also a colorful one. The sentiment from Wait For It is the focus for this design. 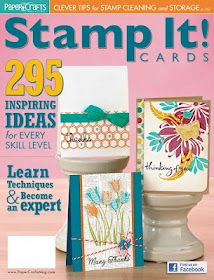 For the details of these cards, please visit CAS-ual Fridays Stamp Blog. I would love it if you can leave me comment there! 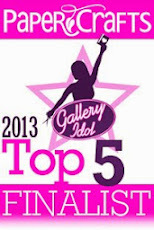 Lastly, just a reminder for Virginia's View Challenge, you have 3 more days to enter! I hoping that we will reach 200 entries (it's 179 as I write this post)!! That will be super amazing! 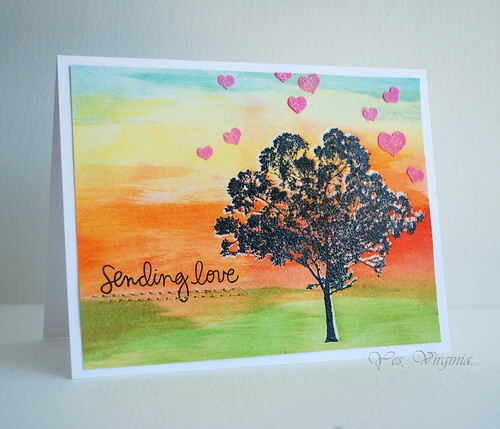 A Stencil Card over Virginia's View Challenge! 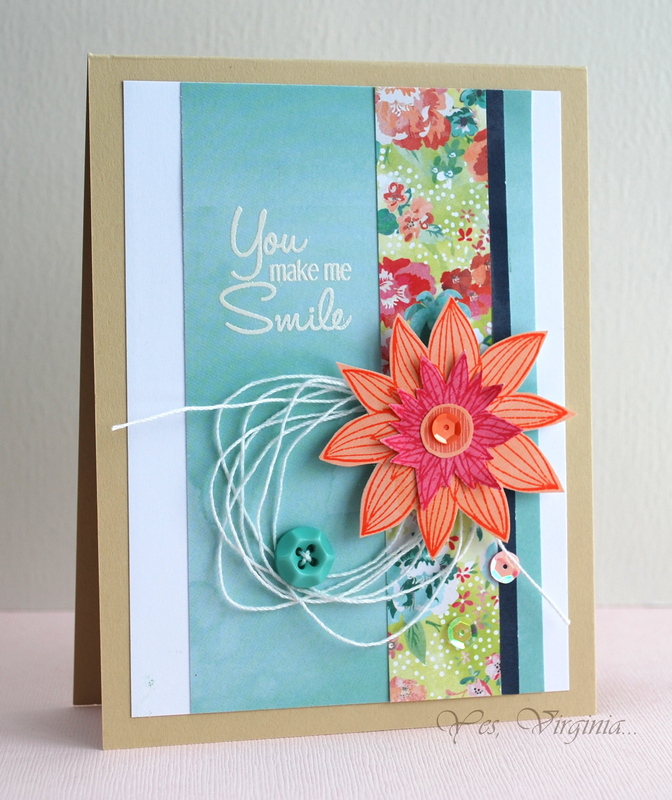 Just to let you know that I am sharing a card (with stencil) over Virginia's View Challenge! 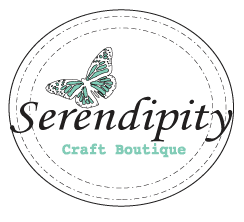 Hope that you stop by to check it out! AND there is STILL time to play the challenge (see here)! 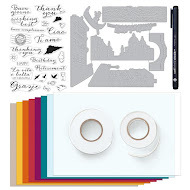 So get your thinking cap on if you have not tackled stencils already! These are the Butterscotch Blondies that I made a little while ago...You can find recipe here. 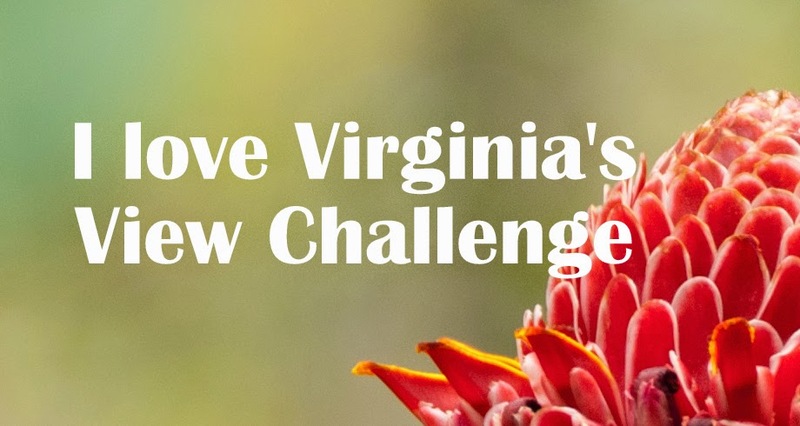 I would love it if you can leave me your feedback over Virginia's View Challenge. 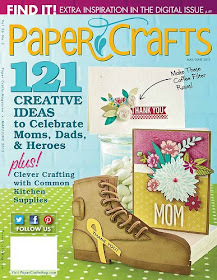 I live half hour away from this two-day paper-crafting convention. It is held yearly and is very popular in my province of Ontario. I have been attending this event almost every year since 2009. I happen to visit one of the store booths called Stamplicity. A few weeks ago, Michele asked us Girl Fridays over CAS-ual Fridays Stamps Blog to send out a few cards for this exhibition. So I did! In this video, you can see the display cards from me and my design team mates at the the booth. It was really fun and satisfying. I got to tell my local stamping friends about it and show them off, too! Stamplicity owner Brenda and her team put a lot of work into setting up the booth. The demo/Make and Take was excellent and well-received. I bought two Wink of Stella pens from them and I can't wait to use those pens that I have been hearing so much about....! Owner of Stamplicity Brenda and Virginia. While I was busy checking out the other booths, I also met up with my two Canadian Girl Fridays Challenge DT--Ardyth and Tracey! This is our 2nd time together. Three hours flew by so very quickly! We had lots of fun browsing the stores and did some shopping! I also met Karen Dunbrook ! Karen is a talented stamper living in my city and is a now a frequent participant in Virginia' View Challenge! I am looking forward to more craft time today. Now that I have new inks and supplies, I can't wait to get inky. Enjoy your Sunday! 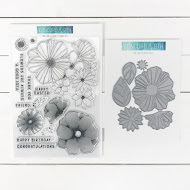 I have been a fan of Lisa Spangler since I started stamping in the online community (circa 2009)! 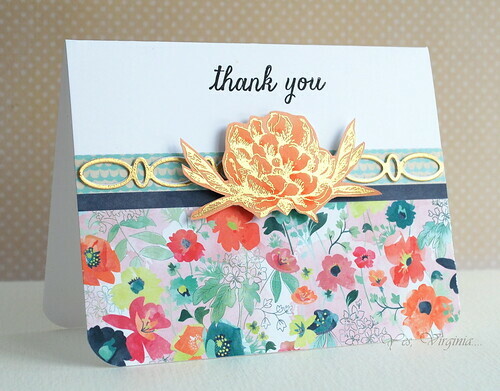 A few days ago, Lisa made a beautiful card for the blog hop (see here) and I was so inspired by her card. Isn't this scene amazing? Lisa's combination of stamps is superb! I adore the night sky that she created. I got my tree stamp out and played! This is the result. I started with a very large piece of watercolor paper and created the background with water and distress inks. Then I stamped the tree in black and then clear-embossed the tree. The tree images were not perfectly lined up, thus you can see the white shadow (which is alright , in my view). Once that's done, I took out a new Heidi Swapp stencil and used the white embossing paste (mixed with Picked Raspberry Distress Ink) to create pink hearts around the tree. After the paste dried, I applied Stickles with a paint brush. I then added my latest craze-- hand-stitched gold thread. The sentiment is from Simon Says Stamps (Handwritten). Ding---> when creating a fully water-colored background, I find that the key to is to use a much larger piece of water-color paper (when possible). That way, you can choose just the section that looks "perfect" for your design. For this card, I used about half of a standard piece of water-color paper. 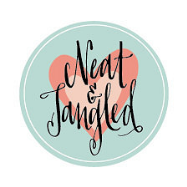 I trimmed off all the edges (as the inking was splotchy) and chose the section that suits my design. Thanks to Lisa's inspiration, I now have this card that I love and will send to someone special! 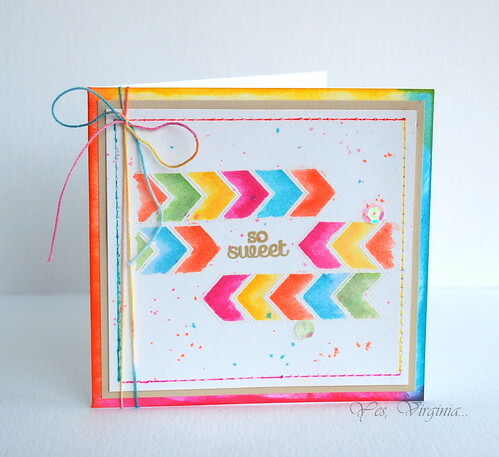 Stencil and Stamp--a great combo! If you can believe it...I was not keen about playing with stencils last year. But with all the new products and inspiration (see Virginia's View Challenge), I think I am finally convinced. 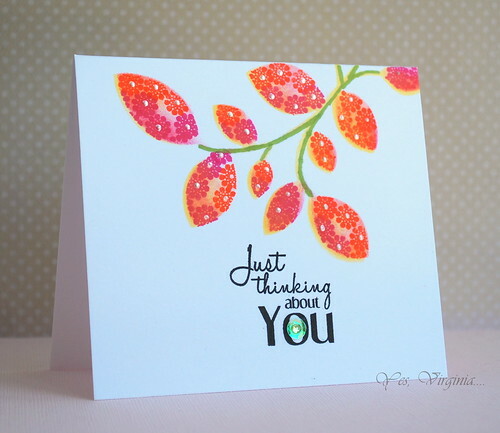 Stencils are great tools for hand-stamped card-making. I have been wanting to try stamping smaller images within stencils. 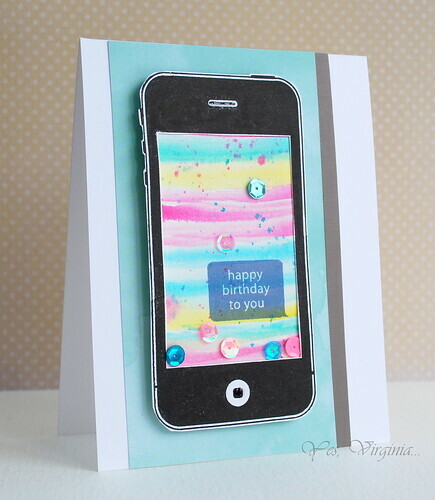 Here's the photo of what I used to create this one layer card. Yes, I am a messy card-maker...my stamps, acrylic blocks, marker and stencil are super dirty well used! 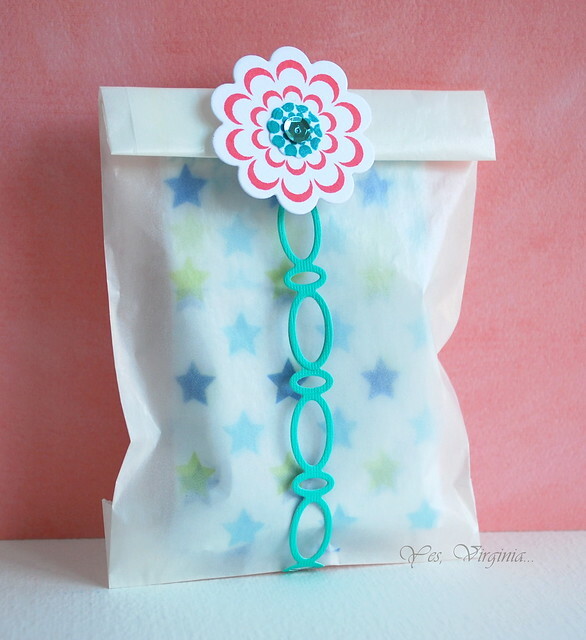 I am linking this up to Moxie Fab World's Styling with Stencils Challenge! Welcome to Day 3 of CAS-ual Fridays Stamp release! This new Fri-dies called "Casual Vine" is a matching set for Beanstalks. How cool is that? 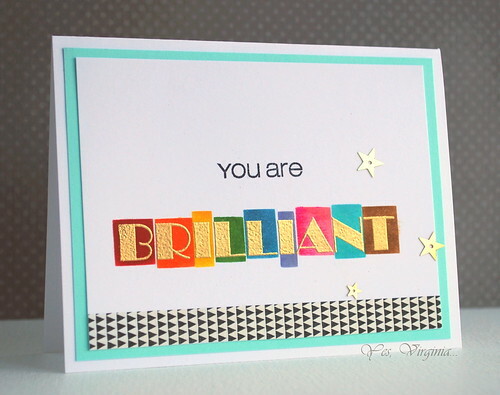 I did some subtle background stamping and bent the sentiment from this set (Out Loud) . The pattern paper is from Basic Grey's RSVP collection. 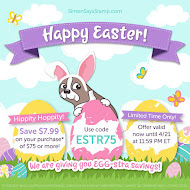 Hope you check out the new designs from my team mates (here) and be sure to leave a comment for a chance to win new stamps! Thanks for stopping by! Hello friends! 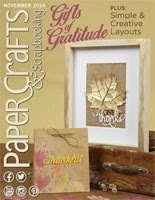 Today is day 2 for CAS-ual Fridays Stamps new release! This new Fri-Dies called Linked is amazing! I did some diecut with a piece of gold and white paper. I then colored the small white ovals with a mixture of Distress Inks and water. Then I put the small colorful oval pieces back into the links. 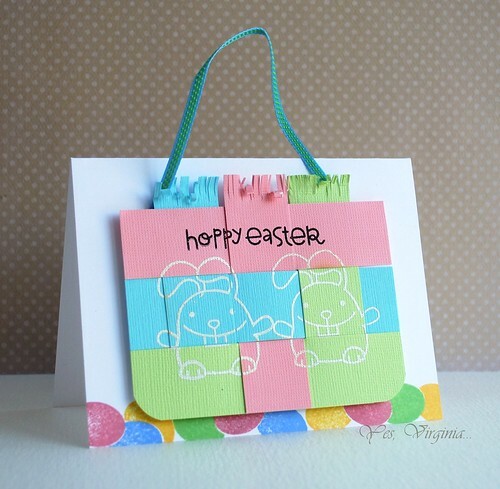 By using the pattern paper, this card came together very easily. This set of Fri-Die is really intricate and versatile! 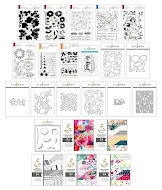 Hope you check out the new designs from my team mates (here) and be sure to leave a comment for a chance to win new stamps! 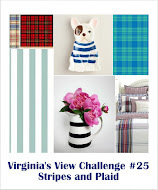 Also, a reminder... please check out Virginia's View Challenge. There is a featured guest designer and she mentioned me in the video (yes, a video!)! Welcome to CAS-ual Fridays April new release! This Fri-dies called Stalk up is a matching set for Beanstalk. I love the fine details of these dies! There is very little you need to do to make it look fancy...you know what I mean? I used Basic Grey pattern paper and did some die cut first. I colored the stamps in TH Distress Inks. Then I fit the stalks back to the spots like a puzzle. So the surface is smooth! I stamped the sentiment at the top right corner and added some faux stitching. Hope you check out the new designs from my team mates (here) and be sure to leave a comment over CAS-ual Fridays Stamps for a chance to win the new stamps/Fri-Dies! Happy Sunday! 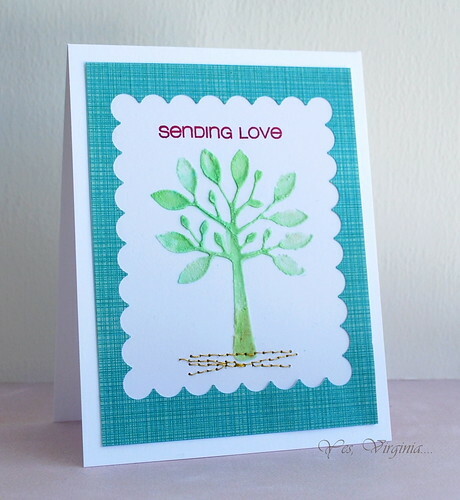 Today I am sharing a card that I made with Wendi Vecchi Embossing Paste and Simon Says Stamp diecut (All Season Tree). Basically I made the stencil with the tree diecut. Today's card is another idea I had while I made this card (see here). 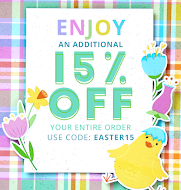 What could be more perfect than to make a paper-weaved basket with the Easter Bunny...? Guest Design for SRM Stickers Challenge!